Olympic champion Jade Jones beat world number one Eva Calvo Gomez in Mexico to land her first World Grand Prix title. 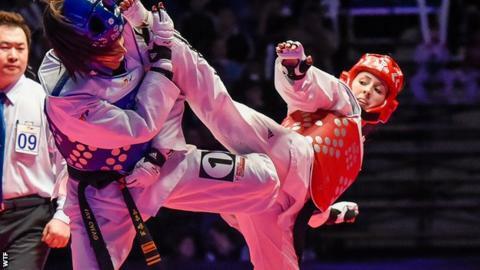 The Welsh 21-year-old had lost to her -57kg rival in the past three taekwondo Grand Prix finals. But after taking a 7-0 lead, Jones saw off a spirited comeback from the Spaniard to run out a 7-3 winner at the event in Queretaro. "It's great to finish the year on such a high," said Jones following her first victory over Gomez in more than a year. The World Grand Prix series began life with the inaugural competition in Manchester last year and returned to the city in October. There have also been meetings in Kazakhstan and Suzhou in China, with Gomez winning all four events prior to Thursday's defeat. Jones, from Flint, survived a late scare in her opening fight with Swedish seventh seed, Nikita Glasnovic, before forcing a winning point in the dying seconds. She then defeated Japan's Mayu Hamada 5-2 in the semi-final. Fellow Britons Mahama Cho and Lutalo Muhammad both lost in their respective quarter-finals. Jones was relieved after ending her losing run against Gomez: "I always find Eva awkward and it has affected me in the past, probably more than it should have done. "But I kept telling myself to relax, enjoy myself more and to think of Rio 2016 as the main aim, that helped me. "It's amazing to have finally won the Grand Prix, Eva is a great opponent and we've had some great battles. "But I really took it to her this time and I was so pleased with the Mexican crowd. "They cheered so loudly when I won both of my video appeals and that made me even more positive." What makes a top taekwondo player? Read more on What makes a top taekwondo player?